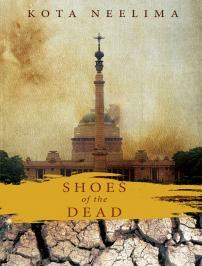 Shoes of The Dead revolves around the Vidharbha and its farmers. Sudhakar Bhadra like countless other farmers of Vidharbha region commits suicide under the weight of successive droughts, unjust politics and debts-ridden life. The district committee of Mityala which routinely fakes account of such suicides to dismiss them does the same to Sudhakar and refuse his wife any compensation . Gangiri, Sudhakar’s brother leaves his life in the city to fight the injustice of the system. Keyur Kashinath is the son of Vaishnav Kashinath, the general secretary of the Democratic Party and he plans to contend for elections from Mityala. Gangiri’s vendetta for justice is a complete deviation from the ideal picture he needs to paint to ensure his place among the body of the elected and therein lays the conflict. The plot is really detailed and you definitely see the author’s experience as a political editor in the details she has used to weave the story together. The strong story is supported completely with strong character development. This book is actually one of the few books that I have read in which characters development is nearly perfect. There are a handful of characters in the book, but each of them have been given there own and appropriate space in the story. The pace of the story is a little slow in the beginning but then it becomes better. Even though the whole story is about topics like farmer suicide, the politics around it and power struggle which are usually boring and difficult to read, the narration makes it impossible for you to loose interest. It is not the usual glamorous narration that you find in most books but its the kind of narration that forces you to read between the lines and makes you think about what the author was actually trying to convey. I loved the book. it was much better that what I had anticipated it to be. I was completely engrossed into the story till the last page. I have to highlight the fact that not even once when I was reading the book did I feel that the story was affected by the author’s personal view which is commendable because people tend to get a little biased when it comes to politics. The fact that she has actually presented both sides of the coin with equal conviction actually forces you to think how complicated and serious this issue is . I would recommend everyone to read this. For me it is definitely a 9/10 for this one. I just wish she had treated the first few pages a little differently but other than that I wouldn’t change a thing about the book.